My friends over at Fabled Environments recently asked me if I would give a review to their new map set “An Average Modern High School” and the adventure made for the map set Brain Slugs from Planet X. Brain Slugs from Planet X is an adventure by the guys from Silver Gryphon games for Savage Worlds. This is a Pulp B-Movie to the core. And the Savage World system complement’s this style of game well. That said when I picked up the PDF and looked at the cover it made me grin and think that there was a lot of potential here if they manage to hit it on the right notes. As you begin to read they go straight to the well and start priming the pump with a good break breakdown of the origins of B-movies and the style of game that Brain Slugs from Planet X is, A pulp alien menace game. And in that vein of B Movies our Stars or Heroes soon discover the aliens plot, yet no matter what they do no one will believe them or have already been turned by the alien menace. So from here we move into the adventure, I will not be posting spoilers but I will point out a few likes and dislikes. I will first start off saying that the first few pages that I have already gone over really help to get me in the right mind-set for the adventure I was about to read. So I was hyped up and ready to go. The story take place obviously in a high school since the adventure is based around the Fabled Environments Map set. But at no point does the story ever feel strained or confined to the location. The School is large enough for the players have encounters throughout the school and even out in the parking lot or baseball/Football fields. So there as a GM you have a wide variety of locations to pick and chose for encounters or RP backdrop locations as the game goes on. The NPC’s bad guys are logical and make for keeping the game “Locked ” into the school easy and make perfect sense . The best part is I did not find any of the adventure to be Strained as far as B-Rated movie style adventures goes. Overall I think this would be an extremely fun convention game or one-off on a night that for one reason or another your regular game can not make. I only have one negative point on the story as it is written. The lead in to why the players begin to think something is up makes no sense. At least from the GM’s point of view. The players first start to become aware that something odd is going on when one of the students is fond dead. From there the chaos ensues as the players are tipped off about the aliens and the school is locked down. Good fun. I love for the fact that this is just a 14 page PDF they Jammed a ton of info into this product. I get Archetypes that I can see myself coming back to time and time again for games in the B-Rated movie theme. I can even see using variations of the Brain slugs in other B-Rated/Zombie B movie style themes. And its a good one-off adventure to whip out on a slow night or run for a Convention game. My issue here is I know gamer’s and they will investigate what happened to the first student who died. There has been a death at the school and I want to know why it happened is how your player will thing. As a GM i know that the student saw evidence of the aliens. But I don’t know what the alien was even up to or why. To me this feels Forced as a way in.. with to little for me to give to my players as confirmation that something serious is going on in their school. Also this whole instance caused me a minor fit as a GM. Even just reading the story for a review I found myself reading the next few pages over two or three times trying to find what I had missed. The Adventure tells us that it is because the student saw one of the Brain Slugs hosts vomiting green slime. (When a brain slug takes a host it replaces vital organs and blood with a green slime. ).. The GM is told that Vomiting green slime is a side effect of not having the slug in the host body.. But here is my point of confusion .. they never tell you where the slug was going or what it was doing out of the host body while the students were in the school .. And the follow-up is that as soon as the student screamed the brain slug killed the student. Because this is a key part of the adventure. It is the “Your party finds themselves at a bar” moment. And I feel that there was much more that could have been done with this part of the story for a better hook. Even with the one story flaw in my mind as much as it bugs me.. That issue is too easliy fixed to give this adventure a pass. I will be using it for some time to come for my B-Rated movie. And I think this will be added to my packet of adventures I bring with me to run at conventions or demo games of. Fabled Environments is a great little company that puts out in my opinion second to none modern maps for your RPG needs. The cost for value alone is staggering. Not to mention the versatility you can get from their products. 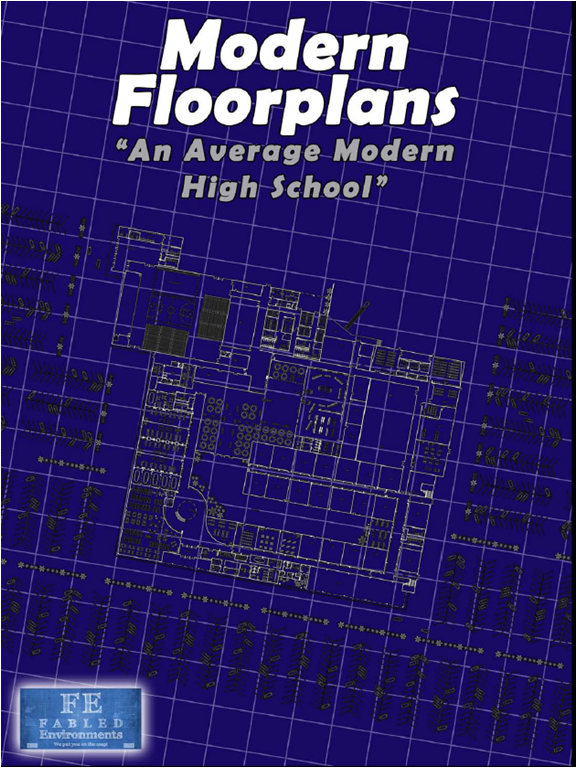 And Modern Floorplans “An average Modern High School” is no exception to this standard. For $15 dollars you get PDF 48 pages in size. the thing is Mammoth. There is everything you are ever going to need for schools in this map.. And many things you could use in other settings as well. With a Baseball Diamond and a Football Field as well as a parking lot. As far as the school maps go. I see many uses other then just schools with this product as well. They Gymnasium could easily be substituted for a athletics center or a public gym or a area community center. The cafeteria in a pinch could also serve as a food court for your needs in game terms.. Unless you already have fabled Environments Average modern Mall map. The class rooms also have several layouts for variety and the whole PDF has been set up with nice easy to click on or off layer features so you can have as much or as little added things to each map layout. Again another fine product to add to your collection. 48 Pages of PDF. That’s just tons of maps for the price. Added with more and more GM’s playing Virtual games now it adds even more use in formats for games on systems that support it like Roll20.net. And events like some of the new trending Virtual conventions such as. AtherCon and VirtuaCon gaining round as Stay at home conventions. This product as a Straight PDF adds even more Value. If you want to print the whole thing out your going to need a gigantic printer to fully appreciate this map. The only other con I could think of is they are not in color.. But that would up the price and we don’t want that now do we ! Heck yes ! With a color map not even near this size running $20 and not even coming close to the versatility and quality that Fabled Environments provides I just cant say no. Previous postChampions 5th Bundle of Holding ! Here’s a friend’s review of the same module/map set I reviewed a few weeks ago. While we both latched onto different things the end result is the same, it is a good product.